Mega Man is one of the characters who has defined Capcom\'s success, and they have given gamers a \'Thank You\' gift by releasing 10 classic Mega Man games in this collection for Mega Man\'s 15th anniversary. Mega Man is a blue robot, originally named Rock. He was Dr. Light\'s assistant who wished to be converted into a warrior robot to defeat the evil Dr. Wily and his robots. And so the saga began. This collection starts in 1987 with the original Mega Man, and ends with Mega Man 8, produced in 1997. With the two Mega Man arcade games thrown in for good measure, you have (in essence) the entire Mega Man classic series. Just to clear up any confusion, the GameBoy Mega Man games are also going to be released shortly for the GameBoy Advance in its own Anniversary Collection. So what kind of game is Mega Man, anyway? How does the boss/power-up system work? Each game has a set of robot masters (6 in MM1, 8 in the rest) which you must defeat in order to progress up to Dr. Wily\'s lab. When you defeat a robot master, you receive a special power-up in the form of its former weapon. And, similar to rock/paper/scissors, various weapons are strong against different enemy bosses. Unfortunately, no one is weak against Mega Man\'s starting weapon the Mega Buster - so you have to break the cycle to start. After this, if you can figure out who is weak against what, the bosses can become much easier. There are also various other items that can be acquired throughout the games, including Magnet Beam (MM1), various Item(s) (MM2), and Rush Adaptors(MM3-8), for Mega Man\'s robot dog, Rush. Later games (MM7&8) also have upgrades purchasable with bolts where Auto (Dr. Light\'s assistant) will build something nice for you. In each case, Mega Man becomes quite powerful by the end of the game. What are the two Arcade games like? Mega Man: The Power Battles and Mega Man 2: The Power Fighters are pretty similar in format, even though the second one has a bit more \'stuff\' (an extra character, etc.). The major difference between the normal Mega Man games and these is that there are no \'levels\' per say - you only fight bosses. You can fight them alone, or with a friend (who inserts a \'coin\' next to you). You also gain their weapon upon defeating the opponent boss as before, though the weaknesses have sometimes changed. The bosses are also rehashed from the original Mega Man games, from 1-7. For example, you might fight Cutman (MM1) and Quickman (MM2) next. Or perhaps Gemini Man (MM3) and then Pharaoh Man (MM4) or Plant Man (MM6). You get the idea. Once you defeat all of the bosses, you fight another more powerful boss, and then finally Wily himself. Being arcade games, each can be beaten in around ten minutes, but it\'s still fun nonetheless. Sometimes the endings can give interesting insight into the storylines as well. So how are the Graphics? The game\'s graphics are very faithfully reproduced from the original games. I found the NES game graphics decent, and certainly playable/believable, but certainly not earth-shattering. The SNES Mega Man 7 has fairly good graphics, and definitely much more \'cartoony\' than the Mega Man X series, for example. Mega Man 8\'s graphics are quite good. They are also much more cartoony than Mega Man X4-X6: more colorful, and I think more \'fun\'. It seems to have several \'layers\', where you may be walking in front of or behind other objects in the scenery. It\'s hard to say why, but I think Mega Man 8\'s graphics are better than Mega Man X4-X6, and most definitely the best in this collection. The two arcade games have decent graphics as well; they are really in between MM7 and MM8 graphically. While not quite as clean as Mega Man 8, certainly at least as good as Mega Man 7. Overall, I am quite satisfied with the graphics on these games, but I also have realistic expectations - they are older games, and in some cases over fifteen years old. It is not appropriate to give a collection like this a \'graphics\' score that weighs into its final grade, so that will be left out. 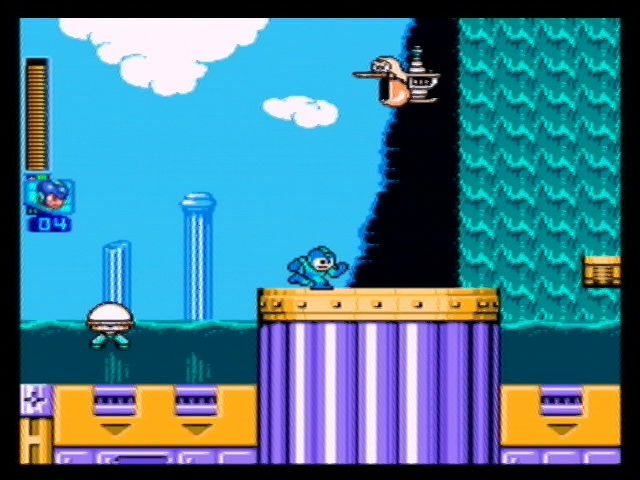 Nevertheless, even Mega Man 1 has graphics that do the game, as well as the NES era, justice. What do we get to hear while playing? Mega Man is well known for its excellent tunes. I have often found myself humming (or even listening to) some musical theme from the series. I especially like the music from NES Mega Man 1 - 3, as well as 7 & 8. The sound effects are also fitting, and are more or less what you expect when playing the appropriate games. I never found a sound effect excessively annoying or unusual. Mega Man 8 has a few voices in places as well. They are generally cheesy, but I found it funny and laughed with it. There were no obvious flaws in the emulation compared to the original games that I remembered, but keep in mind that I have not played all of the original games in the collection. Regardless, nothing felt too out of place even if it wasn\'t exactly like the original, and since many of these games will be new to most players, that will have to suffice. The only flaw I noticed in the version I reviewed (GameCube) is that the music in the NES games loops funny. Basically after a few minutes the songs fade out and start over. It must be the digital format the music was stored in. Not a showstopper, and hardly a big deal, but worth pointing out. So how good are the conversions? Other than the music looping mentioned above, the conversion as I have seen it is nearly perfect. The Mega Man 1-6 games are actually better than the originals for five reasons: 1) There are no problems with limited sound channels (missing sounds) or slowdowns from too many sprites on the screen. 2) They added an optional Navi mode, where you can have an improved UI along with level hints and maps, too. 3) Adjustable difficulty levels (Easy, Normal) and adjustable starting lives (3 or 5). 4) Two extra buttons - one for instant slide (MM3-6) in addition to down+B, and an extremely useful Autofire button. 5) Above all others: BUILT-IN SAVES (along with passwords, if you want to skip ahead). The save game system works excellently. Whenever you get to a continue/stage select screen, the game saves for you automatically. They also add a save game feature to a game that had no passwords - Mega Man 1! The save game feature has to be one of the best additions to these six games. They also added it to Mega Man 7. Mega Man 8\'s conversion is also excellent. I have had no problems to speak of. The game auto-saves for you whenever you leave a level, so you have no worries about lost progress. No complaints here! Mega Man 7 was the only game to lose anything to speak of. According to the Changes FAQ written by \'The Dover Tornado\', the ending has been changed, in that the SNES Mode 7 graphics in the ending has been replaced by a simple credits. It also \'seems\' like the game may slow down ever so slightly at the beginning of each level when starting. This does not affect game play at all. Overall, it is a decent conversion, though not as good as the other ones. I had absolutely no problems enjoying the game, regardless. The arcade games seem perfect. I have noticed no problems at all. Overall, the conversions are excellent. How appropriate are these games for Christians? These games all contain cartoon violence, as the ESRB recommendation states. As a robot, you destroy other robots. Safe for most audiences. In Mega Man 7, a \'Da*n\' is replaced with a \'Darn\', which is a plus in our book. There are no other curse words to my recollection. In Mega Man 8, the mysterious character Duo, who appears to have a special power about him, enters earth as a result of battling a form of \'evil\' energy. He himself shows up as a form of \'good\' energy, but once he is on the Earth he is mostly in his robot form. Whether or not robots can be \'spirits\' or anything else mystical is hard to say. Regardless, it\'s worth pointing out. The \'interesting\' scene is in the intro of Mega Man 8 once you start a new game, so if you have any doubts, please watch this scene before playing to make sure it is alright for you. Overall, these games are pretty much safe for almost any audience. The Mega Man Anniversary Collection is a collection of probably some of the best platform games ever made. Mega Man has spawned many, many games - and this collection is an excellent way to see the reasons why. These games are incredibly fun to play, and will entertain for untold hours on end - there are 10 full games to complete! I can\'t think of a better value, or a collection more well done. Great job, Capcom! These are great games - I have completed every game in the set, and I still wish there were more. If you have no problem with the cartoon violence or any of the other appropriateness issues related to these games, then I highly recommend you pick this one up. You won\'t be sorry, and you\'ll either relive some great gaming moments, or experience the classics for the first time!